I'm sure you've all noticed that I haven't posted since last Monday, but there was good reason for my brief absence — my computer decided it was old and wanted to retire. I know the feeling, but I persevere. Ol' Betsy decided she just didn't want to wake up in the mornings and when I insisted, she just kind of dragged herself up and wouldn't cooperate at all. I had so much to share with all of you and it was deadline week for me, so her timing was really bad! With that said, Ol' Betsy has been moved to a quiet corner of the studio to live out her days and the NEW & IMPROVED Miss Awesome has taken her place. Yes, I had to purchase a new computer, there was no alternative. I can't complain too much though, Ol' Betsy gave me seven years of service. She was my first Mac and in all that time she only had to go in for servicing twice. Once when the CD/DVD drive stopped working and again when her monitor gave out last year. These were very easily rectified by purchasing external components that cost a total of around $200, not bad for seven years, don't you agree? So, Miss Awesome is here now and let me tell you, she is a beauty! She can do so many things that Betsy and I never knew existed and let me tell you, she is FAST! I mean she races around my programs and the internet like nobody's business. I have a hard time keeping up with her. I'm still in the process of transferring files and setting preferences, but in the meantime, I will be here sharing with you. The folks at the Apple Store called Betsy "vintage" (like me) and because of the technology in the new iMacs I wasn't able to do a migration from one to the other, so I'm doing everything by hand. Much longer process, but it gives me a chance to clean up my files and only transfer those I still need. 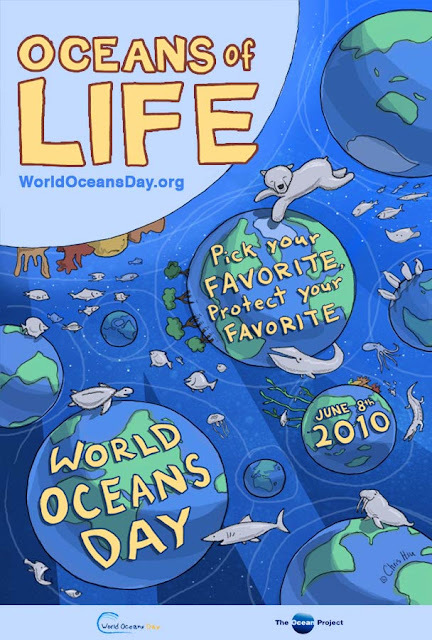 Last year Cris wrote, "I think it's important in this day and age to help increase awareness of the importance the Earth's seas and oceans have for us and the survival of this planet." This was true then and with what is going on in The Gulf, this is uppermost on everyone's mind. So join us and tell us about your favorite ocean animal. You can participate even if you don't stick to the theme, tell us about your favorite beach memory, book or movie. Tell us why you love the beach so much or anything else you can think of, I hope to see you there and here! After tomorrow I have even more to share! I have to show you some fabulous goodies that arrived here at the Tiki Hut from a couple of our favorite blogger buddies, something I added to my Sand Pail* (known as Bucket List to others), and I want to tell you about the Fun In the Sun Expo that was held here in Saint Marys. I also want to share my review of my first beach read this year and there will probably be a recipe on Friday. Boy, looks like it's going to be a busy week around here. *I stole this idea from a friend, I'll tell you who in a future post. Before I leave I want to share a couple of my favorite photos from a post I did last year. 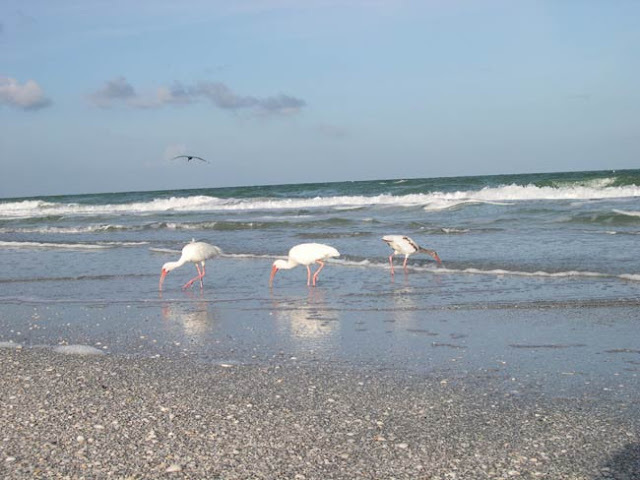 These were taken at Indian Rocks Beach on the Gulf Coast of Florida where I lived for many years until just recently. 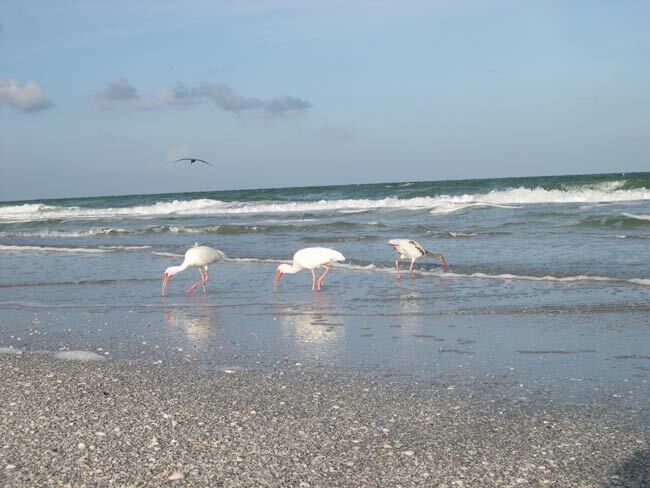 I miss my morning beach walks with the birds and it breaks my heart to know that the oil will soon be there. My heart and my thoughts are with all the residents, both human and animal, who live on the Gulf Coast. There are no words. Oh, your Miss Awesome is a true beauty. I am so glad you were able to save all of your files from Ol' Betsy. Sounds like you got a busy week ahead of you. And my prayers too are with our Gulf Coast. I'm so glad you got everything fixed, Rhonda. Your new computer looks very snazzy! And oh, how my heart aches for the people, the beaches, and the animals on the Gulf Coast. I have a special fondness for that body of water because my young life was always spent going there on vacation where we would crab and swim and deep see fish and sunbathe and do all of those things that children love to do near water. I heard it was washing ashore in Pensacola. I hope and pray that it doesn't make it to Long Boat Key and environs (which is my favorite Florida beaching area), and if it does, I pray it is rectified soon. I hate to think about the sugar sands of that area covered in tar. I love dolphins the best, and there were some just off the coast in that area that used to swim alongside a friend's boat and "visit" with them. They are SO intelligent, and they are also one of the symbols of my college sorority. Love them much. Glad to see you back up and running. Miss Awesome is....AWESOME! My son has one of these, too...and loves it! The immensity of the Gulf tragedy is hard to comprehend, and it's so bloody frustrating that this late in the oil game they still haven't found a way to avoid such "incidents"! argh!!! I have a PC now, but my next babe will be a Mac for sure..., I keep hearing so many good things! And viruses are not such a big issues with Mac either -I hear?! Left a comment on Cris's blog -thanks!!! Congrats on the new computer Rhonda! And, I so love those gorgeous pics and could easily spend a week just lying in the sun there! I love getting new computers...I always have. I only use a laptop these days and mine is 2 years old and I'm wearing it out. It works just fine, but I've actually worn the paint off in places. Poor baby. I am just heartsick about the beaches. 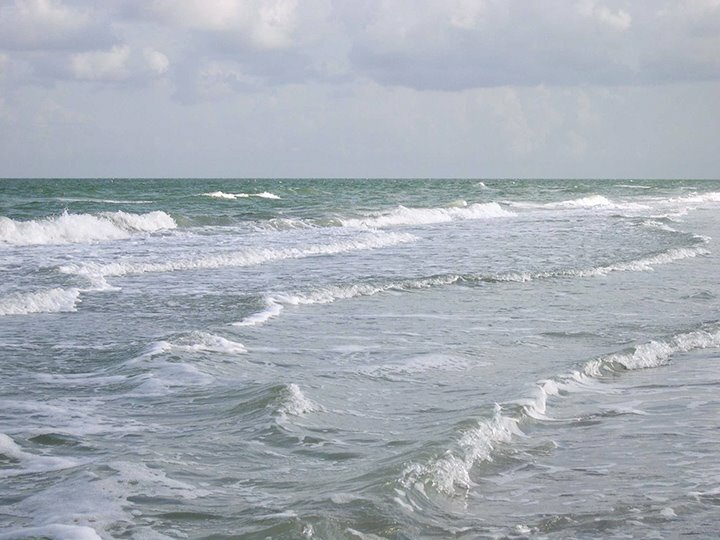 As it creeps into Florida, beaches that I've walked...I can barely watch. I'm headed down that way with my dad in a few days and I wonder if it will have reached our part of the gulf by then. So sad. I've been a mac guy for about 2.5 years and I'm going to be hard pressed to return to my pc days. Mac has treated me like a king. 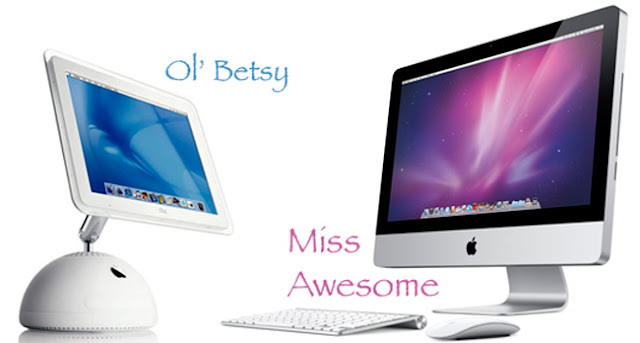 RIP Ol' Betty... but welcome to the hut Miss Awesome! I love that you name your computers... I name everything. My phone (Violet), my iPod (Skully), my friends Keurig Coffee Maker (Phillipe)... so much more fun that way! I'm having a giveaway I thought would be right up your alley... since you love picnics and now have to walk a bit to the beach. Come on by and check it out! I am laughing at your Miss Awesome as I had to buy Mr. Hottie a few weeks ago since his cousin passed away after a few years of a busy life style staying up and blogging all night and the Dr. said he just had to come off of life support. I am still getting use to this new man in a my life. Computers can't live without them. I like your beach photos and it is all so sad. Tonight on Fox they had 3 citizens with a simple solution to soak up the oil and they showed it on TV and they work so why isn't our gov't or BP calling these people to help the oil crisis. I posted Saturday about the oil situation and not many comments and I wonder if people who do not live on the coast care about this??? We are so upset here on Hilton Head that it is all anyone talks about. So sad. Looking forward to your next posts, busy one!!! This post was PACKED with news!